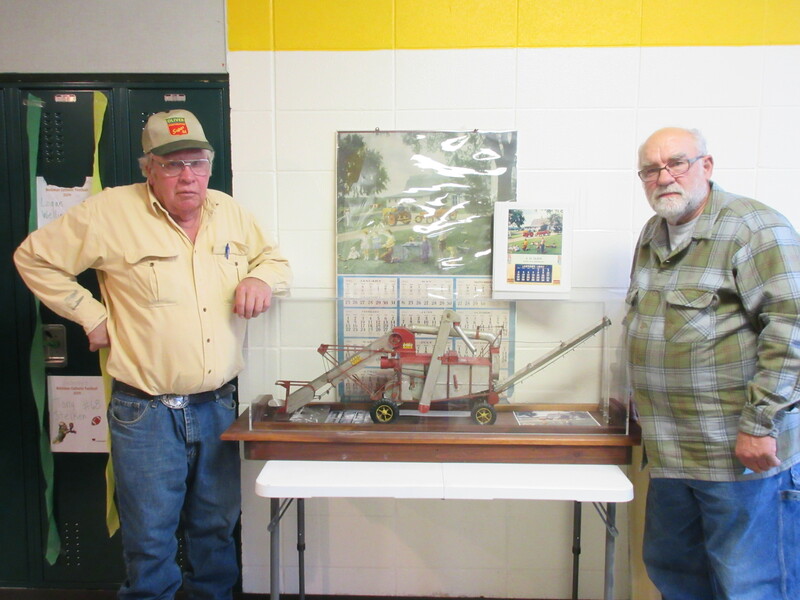 This year at the National Farm Toy Show I had a chance to interview veteran Minneapolis Moline Collectors Jerry Erickson and Loren Book about a corn sheller the two located and bought that is a one of a kind. The two found the corn sheller at auction and this piece had once graced the cover of a January 1942 MM calendar with the Grussing children and a paid model. The children belonged to Bon Grussing Sr. the photographer that took the photographs for the calendar. Jerry identified Grussing Sr. as responsible for many of the advertising successes Minneapolis Moline accomplished. Long story short, they bought the model which was one of 11 toys that was on the calendar at an auction and the two have been sharing the model and displaying it at their respective tractor museums. The model and what happened to the other toys is quite a mystery. The last they were known to be seen was back at an MM branch house in Twin Cities. Where they are now and where they were before the toy showed up on the auction website remains a mystery. Jerry said the only thing the auctioneer would tell him was that a guy got it from his neighbor and that it had sat on his shelf since the 1970’s. Loren brought the beautiful model to the National Farm Toy Show where Jerry was set up as a vendor. They displayed it under one of Jerry’s original 1942 calendar so that collectors could view the toy and the calendar at the same time. The cool part comes next, the two loaned the corn sheller to the National Farm Toy Museum for a year so collectors can visit the museum and see this iconic piece of MM history on display. More details about this story will appear in an upcoming issue of Toy Farmer and in the MM Collector Magazine PGR, but it is an amazing story that came about through my travels. It is wonderful to talk to people about the history of companies and artifacts that have changed America over the years. This corn sheller is a miniature of the B-2 corn sheller built by a company that over the years merged and AGCO of today has roots in MM’s past. Take the time to learn more about your agricultural history when heading out, you never know what mystery you may uncover! For those that want to see this iconic piece of advertising history can visit National Farm Toy Museum. For details about the museum, log onto the National Toy Museum website at http://www.nationalfarmtoymuseum.com. If you would like to make an appointment to visit Jerry’s museum, call 641-390-1045. To schedule a visit to Loren’s museum, call 515-231-6334.